It should be no surprise that there was limited activity in the forex market today ahead of the US midterm elections. Most of the major currencies began the NY session under pressure but as the morning progressed, they recovered slightly. The same behavior was seen in Treasury yields which turned higher after being lower at the start of NY trading. US equities also ended the day in positive territory which tells us that investors don’t think much will change after the US midterm elections. There’s hope that the Republicans will maintain control of the House and Senate and even if the Democrats win the House, the Republican’s control of the Senate could keep President Trump emboldened enough to press forward with his policies and executive orders. If the Republicans maintain control of both parts of the government, the dollar will soar. USD/JPY could hit 114 and EUR/USD could break 1.1350. If Congress is split, with the Democrats controlling the House and Republicans the Senate, the prospect of legislative gridlock that would make it difficult for policies such as the President’s middle class tax cut to pass is negative for the U.S. dollar. But in this case, the reaction should be short-lived. The most bearish scenario for the dollar would be if the Democrats win both the House and Senate, in which case, we should see a very aggressive slide in the USD that takes EUR/USD to 1.15 and USD/JPY to 112. Meanwhile stronger than expected Eurozone data failed to lend any support to the euro. Economists expected German factory orders to fall -0.5% but instead, it rose 0.3%. Eurozone PMIs were also revised higher thanks to improvements in German service sector activity and lastly, producer prices in the Eurozone increased 0.5%, taking the annualized pace of growth up to 4.5%, the highest level since February 2017. These reports signal strength for tomorrow’s Eurozone industrial production release but the improvement could be offset by weaker retail sales. Sterling also ended the day higher. No UK data was released today and despite the Democratic Unionist Party’s warning that they are headed for a no deal Brexit, investors are hopeful. They latched onto Brexit minister Raab’s thumbs up signal after his Cabinet meeting as a sign that things are going well. The clock is ticking and it is too early to tell but for the time being, there’s no doubt that hope is driving sterling flows. As we expected the Australian dollar benefitted from the Reserve Bank’s optimism.After leaving interest rates unchanged, the RBA revised up their 2018 and 2019 GDP forecast and said they see the jobless rate falling to 4.75% in 2020. Although they also said an unchanged policy is consistent with meeting their CPI target over time, they see inflation picking up in the next few years. These subtly hawkish comments were enough for AUD bulls who had been bidding the pair up for the past 4 days. Resistance is at .7300 and if this level is broken, the next stop should be 74 cents. Unlike AUD, the Canadian dollar traded lower despite stronger building permits. Lower oil prices and a higher US dollar were the primary reasons for the currency’s weakness. The focus will be on the New Zealand dollar over the next 24 hours. The latest labor market numbers were very strong with employment rising 1.1% in the third quarter and the unemployment rate falling to a 10 year low 3.9% from 4.4%. As a result of this report and other improvements in the economy, we expect the RBNZ to reiterate their positive outlook for the economy. According to the table below, job ads, card spending, service sector activity and inflation are on the rise. Dairy prices continue to fall but the rest of the economy is doing better. The last time the RBNZ met they said they see early signs of core inflation rising and expect growth to pick up in the coming year. 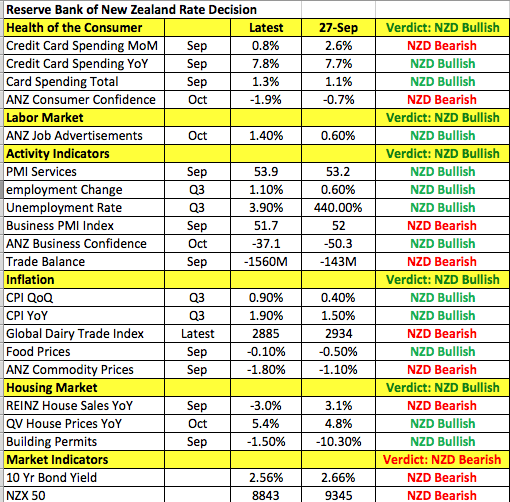 However NZD/USD sold off because they highlighted the downside risks and the need for monetary policy to remain expansionary for a considerable period of time. We don’t expect much change to the policy statement this month but their optimism is reinforced by recent data, reducing the chance of easing. Like AUD/USD, NZD/USD is deeply oversold and any hint of RBNZ positivity could take the pair above resistance at 68 cents.